In the last two blogs, we discussed both abrasion and erosion as they relate to the dentition. In this blog, we will look at another type of dental wear…dental attrition. Dental Attrition is the second most common type of tooth wear; the first being dental abrasion. 1. It is caused by grinding, bruxing and clenching your teeth together. This often occurs at night during sleep and most people are totally unaware that they are even doing it. It is common however for people to wake up in the morning with their teeth ‘clenched’ tightly together accompanied by soreness in the muscles of the jaw. Emotional stress is a big contributing factor. 2. 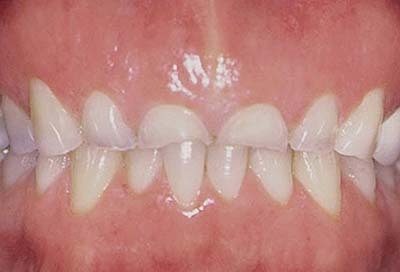 Attrition can also be caused by a malocclusion of the teeth. This is when the teeth in the upper and lower jaw do not come together (occlude) properly. If the teeth do not occlude properly, then the forces between them will not be distributed evenly I.e., certain teeth may be subjected to more force than others when they come into contact. This will cause uneven wear of the teeth. What is the reason for the Wear? The loss of tooth structure is caused by the excessive mechanical forces that are being applied to the teeth. Although enamel is the strongest substance in the body, repeated forces can still cause it to wear. When the wear reaches into the dentin, the rate of wear is much quicker as the dentin is quite a bit softer than the enamel. Aging is a big factor in attrition: the longer the undesirable forces are applied, the more wear there will be. There is a certain amount of dental attrition that normally occurs in an individual’s lifetime. This is due to the mechanical forces that are exerted when the teeth are brought together when chewing while eating or during swallowing. The amount of mechanical stress that is felt by the teeth during these instances is quite small compared to that of clenching or grinding. Clenching, grinding and clicking (tapping the teeth together) are known as ‘Parafunctional’ habits. These are habits which result in greater forces and hence greater wear than when the teeth come into contact under normal circumstances, for instance, chewing. i. A Night guard. We discussed this previously in the blog “TMD – Treatment Options,” posted on November 3, 2011 (point number 5). ii. Deal with the malocclusion. This may be through orthodontics (see blog “Get ready to brace yourself” posted on September 2, 2012) or an occlusal adjustment (selective spot grinding). iii. Address any issues of emotional stress. This is a big factor as this a major cause of bruxing or grinding. In the next blog we will discuss this issue.